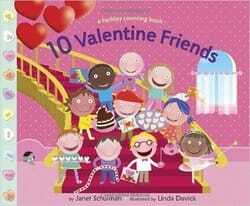 It's Valentine's Day and the 10 little neighbors in this book are busy making Valentines for their closest friends. Will everyone get a Valentine at the big Valentine's Day party? You can count on it! With its fun counting element, bouncy text, and adorable illustrations, this book is the perfect gift for young lovebugs.